We stock the largest selection correction bits in the industry. We also offer competitive pricing on all of our products. This happens to be one of our exclusive horse bits we have to offer. The copper in this bit will help with the horses salivation making it more convenient. This Correction Bit with Aluminum Shanks has solid copper barrels. 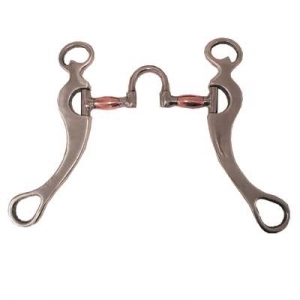 This correction bit is perfect for your horse and measures 5'' in size.